My friends would most likely tell you that I am a very self-disciplined person but I haven’t always been that way. I have implemented certain techniques (many of them are mental strategies) that help me to follow through. Let’s take exercise for an example. I exercise 6 days a week and I am very consistent (even when I travel). There are so many people who want to get in shape but I think they approach it the wrong way. Of course he could run 5 km but he seemed overwhelmed my the thought alone. He told me that he lacks motivation, has too much weight and that the winter in Canada is too long and too cold. Yup, there is never a shortage of excuses wherever I go. Excuses or results – unfortunately we cannot have both. Oops. I know this thought process seems to be a technicality but it is a pretty important one when it comes to our mind. Think about the weight you want to have and not about how much you want to lose. Deal? Isn’t it true that most people jump right back to their “old” weight after they have done a diet or a weight loss challenge for a few weeks? If you count the exercise days or the weeks, it’s just a way that you can tell others later how long you have lasted. Being mentally and physically fit is a lifestyle. You gotta live it. You gotta breathe it. For me it is living life in moderation – I have my wine. I have my ice cream. I eat my pizza. I have some chocolate here and there. If I refrain myself from not having these things for a few weeks, I want them even more after. It doesn’t help you to count calories for a few weeks. It doesn’t help you to count the weeks in a weight loss challenge. It doesn’t help you to imagine broccoli would taste like chocolate. It doesn’t help you to think about what you want to get away from (too much weight, too big dress sizes, too much food intake, lack of motivation, etc.). 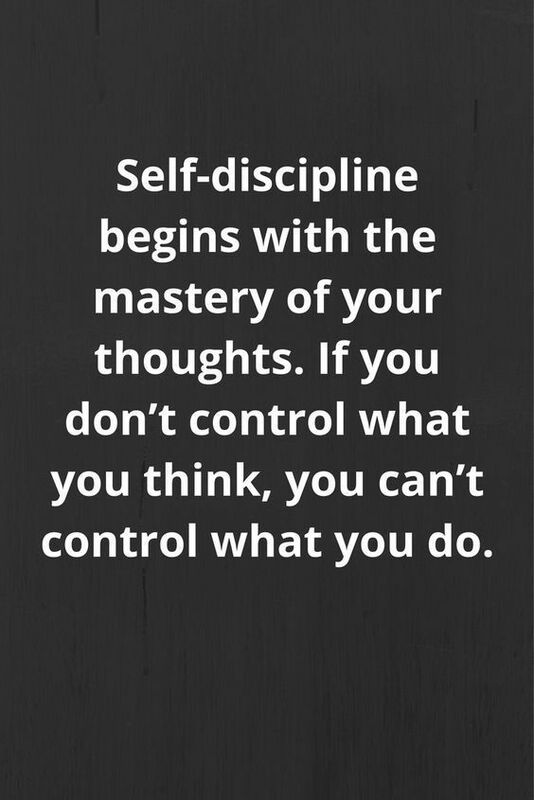 Do you want to hear my magic formula how I implemented self-discipline into my life? Make a plan – have specific days (mornings or evenings) that are your exercise days and cut certain foods from your diet (i.e. muffins, high calorie drinks, creamy sauces and dressings) – i.e. in the winter I run Tuesday, Thursday and Saturday morning, I go to my cross-fit training on Monday, Wednesday and Friday; I think everyone should go for a 30 minute walk daily. In the summer I replace some of it with cycling and swimming, depending on my goal. Acknowledge that the toughest part of the workout is getting out of bed and/or out of the house – if you manage that, you can consider the workout as being done. Find something that brings you joy – if you don’t like running, don’t run – go for a walk instead. If you don’t like cycling, don’t cycle – go for a swim instead. Surround yourself with people who have certain character traits that you would like to develop – if you want to fly with the eagles, don’t go swimming with the ducks. Visualize yourself living a fit and healthy lifestyle – it’s about feeling good in your own skin (mentally and physically) and not about obsessing about weight and body fat. Have fun and smile along the way – you cannot maintain anything if it is a “I must do” instead of a “I want to”. If you practise self-discipline in your personal life, it will spill over into your professional life. Guaranteed! Use it in your advantage. You deserve to be at your best!